Sure, it's not the PSOne, but Grim Fandango actually is now available on PlayStation consoles, namely the PlayStation 4 and PlayStation Vita, thanks to Double Fine's Grim Fandango Remastered. Grim Fandango seemed like a game that was made for consoles, yet for some reason it was only released for Windows. It turns out that it was developed for a console after all, the original PlayStation. 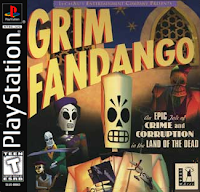 Grim Fandango was released on the PC in 1998, at the end of the PlayStation's life cycle. The PlayStation 2 was right around the corner, so LucasArts dropped their plans for releasing the game to the PSOne. But, now, Grim Fandango for the PlayStation appears to have hit the internet. Reportedly, it is in a fairly finished state, and it is completable to the end. I can't post a link to this here due to the fact that it's an unauthorized leak, but it shouldn't be too hard to find with a quick Google search.